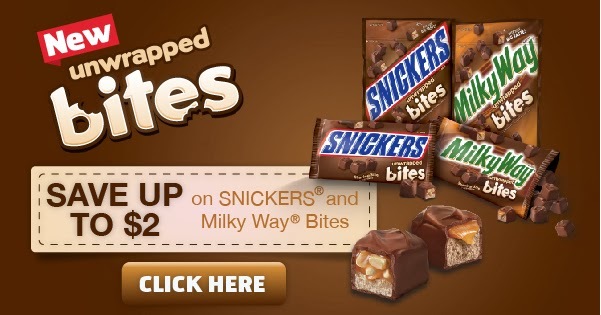 Save BIG on Snickers & Milky Way Bites! I am a member of the Collective Bias® Social Fabric® Community. This post has been compensated as part of a social shopper insights study for Collective Bias and their client. I don't know about you, but Football Game Day is a HUGE deal in our house! My husband and I (and now our kids!) are HUGE NFL football fans and we are always looking for great snacks (and CHOCOLATE!) to serve at our football parties each week! I have recently become addicted to the new Snickers and Milky Way Bites...and not just for dessert! They are so addicting and they make a tasty little treat! If you love chocolate, you won't be able to resist new SNICKERS(r) and Milky Way(r) Bites. Enjoy unwrapped, bite-sized morsels that are great in recipes or by themselves! For tailgating, these #GameDayBites will be sure to make the crowd go wild. Hurry before coupons run out!